The environmental movement runs on innovation. Our biggest victories aren’t won by out-spending or out-muscling our adversaries. Instead, we out-maneuver. We meet big challenges with even bigger creativity. And there are few challenges larger than taking on Thai Union Group. Thai Union is the world’s largest canned tuna company. Its major brands in the United States, United Kingdom, Italy, Thailand and more control 18 percent of the global market and raked in upwards of $5 billion in profits last year. 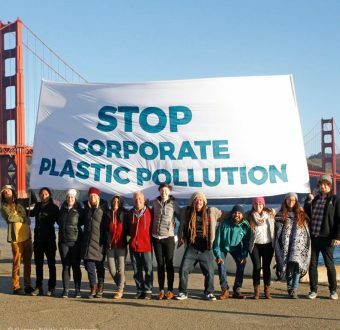 But rather than use its influence to lead on sustainability, the company is behind some of the most devastating environmental and human rights abuses in the industry, having been repeatedly linked to destructive fishing methods, human trafficking and even forced labor. All this and you still probably haven’t heard of Thai Union. Based on its social and environmental record, that may well be the way company execs want it. They’d prefer to hide behind the advertising campaigns and front groups that have greenwashed the commercial tuna fishing industry’s image for decades, keeping consumers in the dark about the devastation feeding their families. Thai Union is flexing its economic muscle to sweep the issue under the rug. But we’re flexing our creative muscle with help from artist Aaron Staples to speak truth to power and change the tuna industry for good. Art by Aaron Staples shows the environmental destruction implicit in commercial tuna fishing: thousands of sharks, turtles and other “unwanted” species are caught and thrown away to die each year. Click to enlarge. 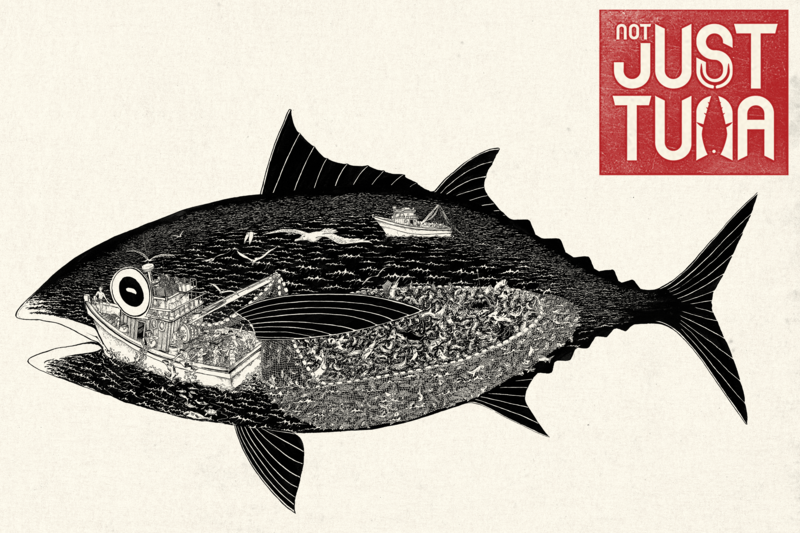 The story of tuna is one of complexity. It’s an industry made up of equal parts environmental, social and economic pitfalls, and fixing it requires addressing each of these dimensions. 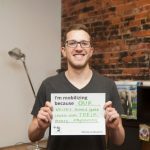 And while it might be tempting to isolate these challenges and address them one by one, that’s not how Aaron approached his work. To do this, he chose to represent as many layers as possible in each image. 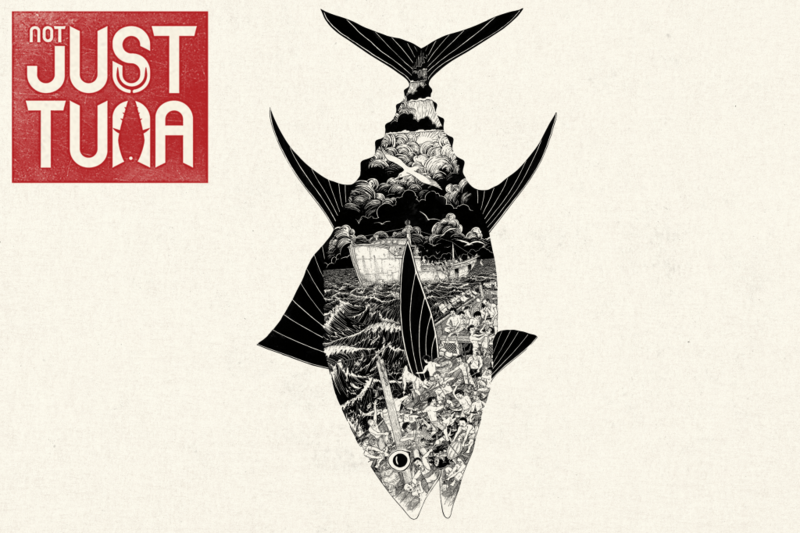 Aaron’s depiction of commercial tuna fishing combines both the environmental and social dimensions, here showing both destructive fishing methods and overworked fishermen. Click to enlarge. Art and activism are both built on exposing the truth. Art in particular has the ability to convey powerful messages across the linguistic and cultural barriers that so often divide us. Tapping into emotion, Aaron says, is central to achieving this. In representing the tuna industry, Aaron says he honed in on anguish, shock and empathy to inform his artistic direction — the anguish of those trapped in deplorable working conditions on tuna vessels, a sense of shock that these egregious practices continue unchecked, and empathy in the viewer. Part of the activist’s challenge is to grip, to inspire people to action. With the avalanche of information most of us are faced with every day, this is increasingly hard to do. Sometimes it’s too much to ask people to stop and think; sometimes it’s too much to just ask them to stop. Aaron told us he was particularly struck by the human rights violations present in the tuna industry. Workers on tuna vessels have reported being forced to work as much as 20 hours in a row for little or no pay. Click to enlarge. Of course, neither artists nor activists are inclined to take the safe road. We both face and overcome inherent risks in what we do every day. For the past month, we’ve been asking you to take a risk with us by confronting Thai Union and its global brands, like Chicken of the Sea. 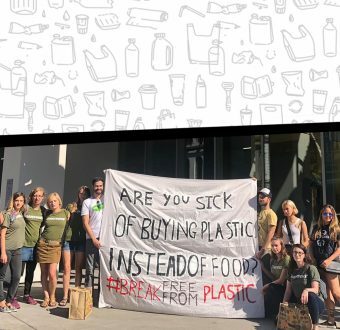 We’ve asked you to change your shopping habits, make a statement with your dollar, and raise your voice for a sustainable, ethical tuna industry. More than 250,000 of you have taken that risk with us. Together, our actions have had a big impact. 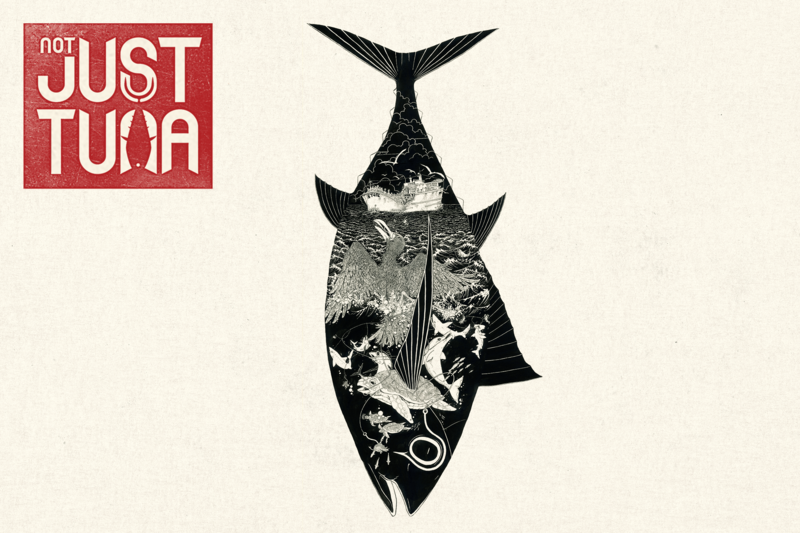 We’ve gotten the public’s attention, changed policies and forced the spotlight to shine brighter on Thai Union than it ever has before — and with each risk we take we are changing the story of tuna.